Source: Mennonite Library and Archives, Bethel College, North Newton, KS: 2004-0093. The Alexanderwohl Mennonite village and congregation originated in 1821 when twenty-one Mennonite families left their home community near Schwetz and Kulm on the Vistula River to settle In Ukraine. 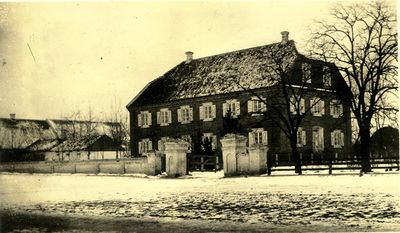 The settlement near Schwetz was known as Przechovka or Kleinsee. Exactly when this settlement and the congregation here originated is unknown, although 1640 is date of the first lease of Prechowka by Mennonites. Presumably the congregation started around that time. The church register was started in the 18th century by Aeltester Jacob Wedel, who was Aeltester from 1754 to 1791. This church record is in the possession of the Alexanderwohl Mennonite Church in Kansas. The title page reads: Die Erste Stamm Nahmen Unserer Bisher so genante Oude Vlamingen oder Groningersche Mennonisten Societaet alhier in Preusen. The record begins with a list of names common in the congregation at that time and occasionally states from where the bearer of the name came. Some of the more common names in the church record during the seventeenth and eighteenth century are Becker, Buller, Cornels, Decker, Dirks, Funck, Jantz, Isaak, Koehn, Nachtigahl, Pankratz, Penner, Ratzlaff, Richert, Schellenberger, Wedel, Frey, Schmidt, Sperling, Unrau and Voth. Most of these names are still common in the Alexanderwohl community in Kansas. From the reference to "Old Flemish" or "Groninger Mennonites" one is not to understand that the congregation came in a body from the Netherlands, but this indicates that it was affiliated with the Flemish rather than the Frisian conference. The "Old" indicates that the congregation originally had very conservative leanings. According to the names, some of the original members must have come from the Netherlands, some from the neighboring Lutherans, and one, Schellenberger, from the Hutterian Brethren. The first known elder of the congregation was Berend Ratzlaff. Others who served in Prussia were Benjamin Wedel I, 1742-1785; Jakob Wedel, 1754-1791; Peter Jantz, 1774-1810; Benjamin Wedel II, 1766-1813; Peter Wedel I, 1769-1814? ; and Peter Wedel II, 1792-1821. Under the leadership of Peter Wedel the group moved from Prussia to Russia in 1821. Wedel was succeeded by Jakob Buller (1827-1901) who led the congregation from Russia to America in 1874. Here he was followed by Peter Balzer (1874-1907), Heinrich Banman (1843-1933), P. H. Unruh (1881-1943), and Philipp A. Wedel (1897- ). From time to time Mennonites left the Schwetz settlement, organizing new congregations at different places. In 1765 some families founded the Brenkenhoffswalde-Franztal settlement in Mark Brandenburg. Most of these later went to Russia, establishing such villages as Gnadenfeldand Waldheim on the Molotschna in the neighborhood of Alexanderwohl, with whom they kept in contact. When Elder Peter Wedel led a group of twenty one families of the Schwetz congregation to the Molotschna settlement in 1821, they are said to have been met by Tsar Alexander I, who wished them well in their undertaking. Hence the name "Alexanderwohl" for the village and congregation established in the heart of the Molotschna settlement. In 1823 a few more families joined them. In 1903 the village had a population of 630 and owned a complex of 6,210 acres of land. In addition to cattle and sheep, wheat was raised in great quantities. Johann Cornies was the benefactor of this community also, aiding it in many cultural and economic gains. The Alexanderwohl Mennonite congregation erected a church building in 1865 after having conducted services in the school building for some time. After Elder Jakob Buller migrated to America with the Alexanderwohl congregation, the new occupants of the village organized a new Alexanderwohl congregation. However, this congregation was served by the elders of the Margenau Mennonite Church. Before World War II about one-third of the village belonged to the Mennonite Brethren Church. During the Revolution Alexanderwohl suffered like the rest of the Molotschna settlement and World War II brought exile and evacuation which spelled the end of Alexanderwohl in Russia. Banman, H. "Geschichte der Alexanderwohler Mennoniten-Gemeinde bei Goessel, Kansas." Bundesbote-Kalendar (1926). Dyck, A. J. “Hoffnungsau in Kansas.” Mennonite Life (October 1949): 18-19, 46. Available in full electronic text at http://ml.bethelks.edu/store/ml/files/1949oct.pdf. From the Steppes to the Prairies, edited by Cornelius Krahn. Newton, KS: Mennonite Publication Office, 1949. Hege, Christian and Christian Neff. Mennonitisches Lexikon, 4 vols. Frankfurt & Weierhof: Hege; Karlsruhe: Schneider, 1913-1967: v. I, 25. Unruh, Benjamin H. "Die Mennoniten in der Neu-Mark." Gemeinde-Kalendar (1941). Krahn, Cornelius and Glenn Penner. "Alexanderwohl (Molotschna Mennonite Settlement, Zaporizhia Oblast, Ukraine)." Global Anabaptist Mennonite Encyclopedia Online. March 2011. Web. 19 Apr 2019. http://gameo.org/index.php?title=Alexanderwohl_(Molotschna_Mennonite_Settlement,_Zaporizhia_Oblast,_Ukraine)&oldid=162984. Krahn, Cornelius and Glenn Penner. (March 2011). Alexanderwohl (Molotschna Mennonite Settlement, Zaporizhia Oblast, Ukraine). Global Anabaptist Mennonite Encyclopedia Online. Retrieved 19 April 2019, from http://gameo.org/index.php?title=Alexanderwohl_(Molotschna_Mennonite_Settlement,_Zaporizhia_Oblast,_Ukraine)&oldid=162984. Adapted by permission of Herald Press, Harrisonburg, Virginia, from Mennonite Encyclopedia, Vol. 1, pp. 48-50. All rights reserved. This page was last modified on 13 January 2019, at 15:36.